We hope you find this history section interesting and enjoyable. 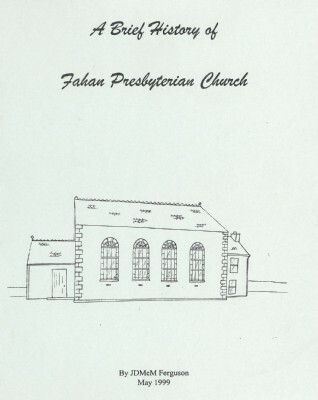 This WEB section has been written to give readers an idea about the history of Fahan Presbyterian Church. 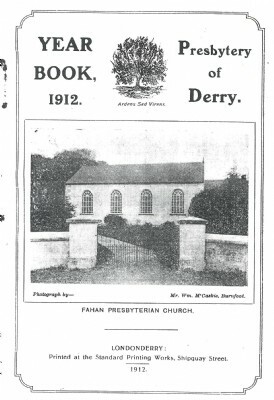 It came as a surprise to the author, knowing of the long history regarding the Meeting House in Fahan, that there was little written down or known by the younger generations. As I am not a historian or even an amateur one, this booklet is really a gathering of information with little comment. It will become clear during reading that there are many gaps in the churches history. This is because of the lack of recorded notes either because they do not exist or are not available. For this reason some periods have as little detail as just knowing the name of the Minister of the time while at other times we can glean a bit more information. The details of this are recorded in the reference section. 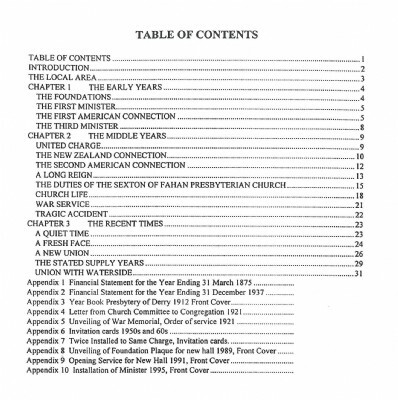 It should be noted that the periods that have little detail does not imply that little has occurred or that there are not important characters involved with the church, it is just I was unable to find any information. It is hoped that if ever a more expanded church history is written then the gaps will be filled in. I hope you will find something of interest as you read.